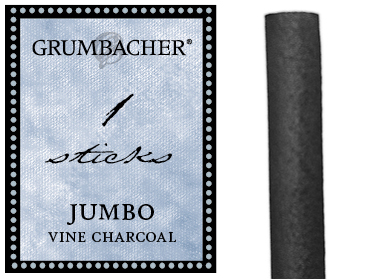 Grumbacher® extra soft vine charcoal is created by burning hand-selected vines at high temperatures to produce a rich, dark stick. V40 measures approximately .25 (.635 cm) in diameter. Because it is a natural product sizes may vary slightly. Sold in packs of 3 and 12. Made in the USA. 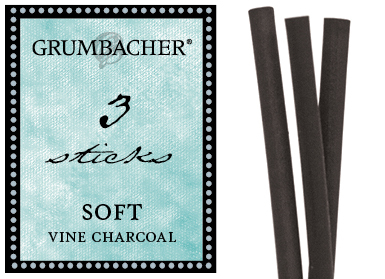 Grumbacher® soft vine charcoal is created by burning hand-selected vines at high temperatures to produce a velvety stick with a slightly less intense black than our extra soft V40. V41 measures approximately .25 (.635 cm) in diameter. Because it is a natural product sizes may vary slightly. Sold in packs of 3 and 12. Made in the USA. 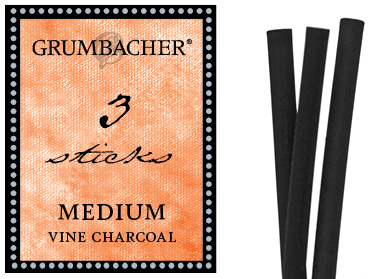 Grumbacher® medium vine charcoal is created by burning hand-selected vines at high temperatures to produce a smooth stick with a very dark gray color. V42 measures approximately .25 (.635 cm) in diameter. Because it is a natural product sizes may vary slightly. Sold in packs of 3 and 12. Made in the USA. 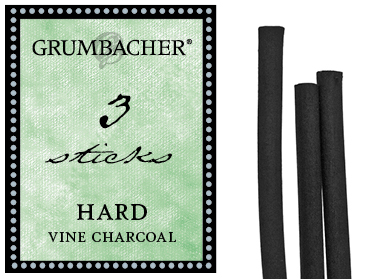 Grumbacher® hard vine charcoal is created by burning hand-selected vines at high temperatures to produce a dark stick that sharpens well, and is ideal for fine lines and detail. V43 measures approximately .25 (.635 cm) in diameter. Because it is a natural product sizes may vary slightly. Sold in packs of 3 and 12. Made in the USA. 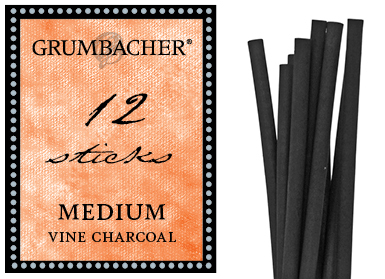 Grumbacher® uses high quality vine to create a charcoal that is rich, blendable and lays down smoothly. V9 vine charcoal is a medium degree, extra large stick with a dark gray color that measures approximately .625"W x 5.75L (1.58 cm x 14.6 cm). Because it is a natural product sizes may vary slightly. Sold in packs of 1. Made in the USA. 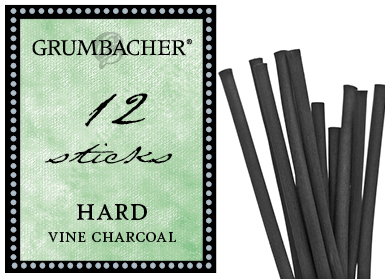 Grumbacher® uses high quality vine to create a charcoal that is rich, blendable and lays down smoothly. 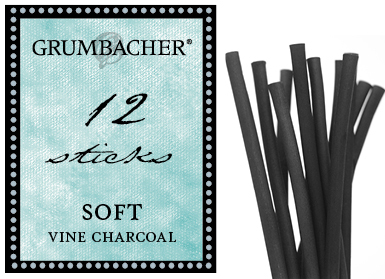 V9 vine charcoal is a medium degree, extra large stick with a dark gray color that measures approximately .625″W x 5.75L (1.58 cm x 14.6 cm). Because it is a natural product sizes may vary slightly. Sold in packs of 1. Made in the USA. 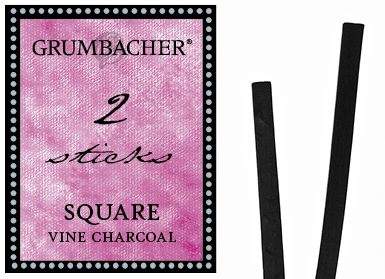 Grumbacher® uses high quality vine to create a charcoal that is rich, blendable and lays down smoothly. 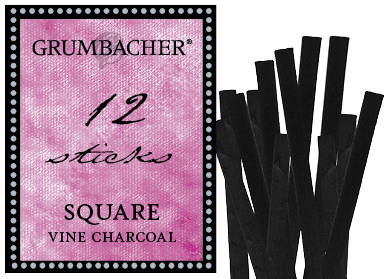 V16 vine charcoal is a medium degree square stick with a dark gray color that measures approximately .25W x 5.75L (.635 cm x 14.6 cm). Because it is a natural product sizes may vary slightly. Sold in packs of 2 and 12. Made in the USA. 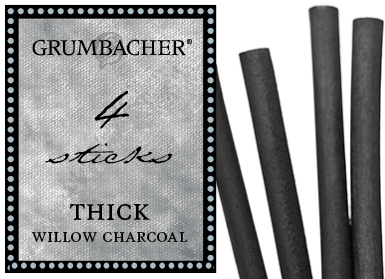 Grumbacher® willow charcoal is made from burning natural, uncompressed willow rods to create charcoal in a range of diameters. Willow is ideal for laying down preliminary sketches for paintings and drawings. 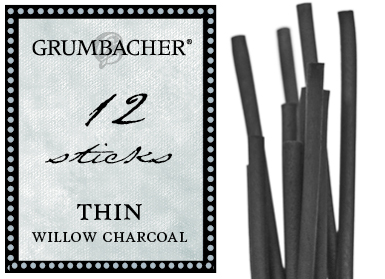 Thin Willow Charcoal measures approximately .125” (.3 cm)) in diameter. 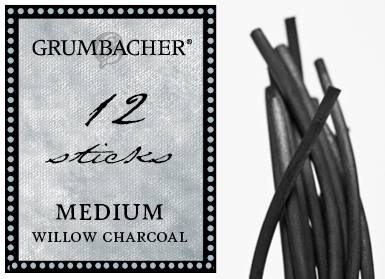 Grumbacher® willow charcoal is made from burning natural, uncompressed willow rods to create charcoal in a range of diameters. Willow is ideal for laying down preliminary sketches for paintings and drawings. 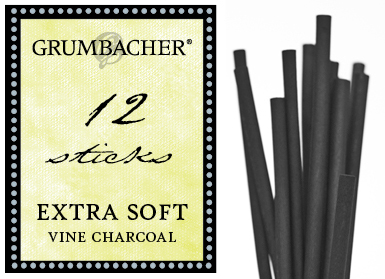 Thick Willow Charcoal measures approximately .3125” (.79 cm) in diameter. 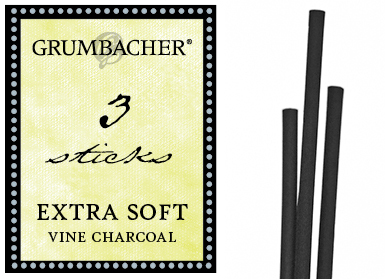 Grumbacher® willow charcoal is made from burning natural, uncompressed willow rods to create charcoal in a range of diameters. Willow is ideal for laying down preliminary sketches for paintings and drawings. Medium Willow Charcoal measures .25” (.635 cm) in diameter.